SD Bullion offers these 2017 American Platinum Eagle coins at the lowest price in the industry, guaranteed. Proudly celebrating the 20th anniversary of its release, the 2017 one ounce Platinum Eagle is now available at SD Bullion. It is America’s official platinum bullion coin and has a face value guaranteed by the United States Government. Ever since this coin was first released in 1997, it has enjoyed worldwide renown, not unlike its Gold and Silver counterparts. Featuring the intricate artwork by the former US Mint Chief Engraver, John Mercanti, these coins portray the beautiful images on brilliant Platinum. Each 2017 Platinum Eagle is struck from the finest 0.9995 purity Platinum (Pt), weighing 1 troy ounce. Moreover, each of these platinum coins is in Brilliant Uncirculated (BU) condition. With a face value of $100, Platinum Eagles have the largest denomination of any official American bullion to date. Furthermore, the United States Mint guarantees the quality and weight of Platinum content in the coin, inspiring confidence among investors. The obverses of these coins feature the stunning John Mercanti masterpiece of the Lady Liberty head. To the right of her image, the year of issue ‘2017’ and the phrase ‘In God We Trust’ is imprinted. Gracefully above her image, the word ‘LIBERTY’ is spelled out as well. Bearing the depiction of the United States’ majestic National Bird, the Bald Eagle, the reverse of the coin is a remarkable sight too. Seen in the backdrop of the Eagle, the rising sun with its rays just beginning to appear over the horizon. Below this image, the coin’s face value ‘$100’ is imprinted. Additionally, the issuing country ‘United States of America’ and the weight and purity of Platinum are also visible on this side. Since the 2017 release of these famous Platinum Eagles is their 20th release, they are bound to attract attention from buyers over the globe. 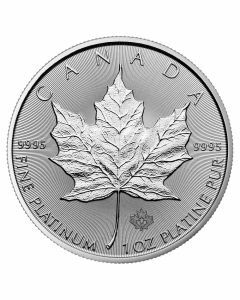 The 1 ounce of pure Platinum will allow investors to diversify their investment portfolios significantly. Moreover, collectors who wish to complete their American Eagle collections should grab these coins soon as well.